Greeting Cards are one of best way to send our best wishes for loved ones. They occupy special place in our heart. That is the reason we prefer handmade greeting cards over costly manufactured cards. We can pour our feelings with these cards and write our soulful message. 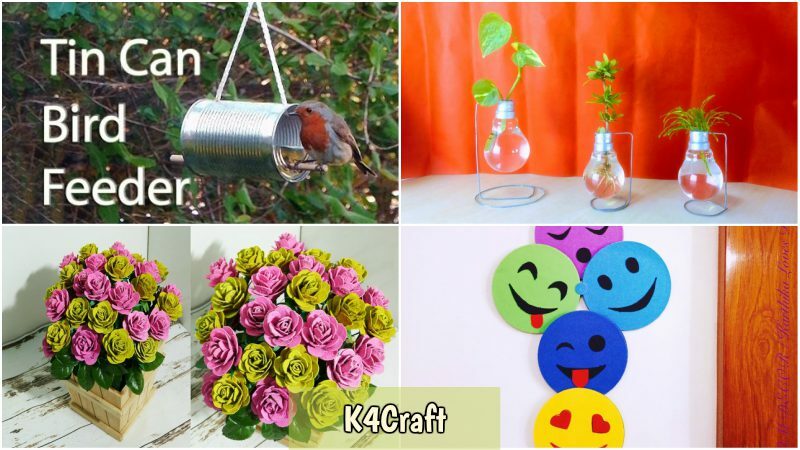 To help you, K4Craft created several cards for several occasions. Hope you will like them. Accordion fold card makes for great display. This could be really fun for everyone. Children can fill the pages with funny cartoons, drawings or even paste in photos . This is a good idea to create a long zine. Here some easy steps to learn Accordion fold Thank You Card. Take a papersheet and measure the length of 7 cm draw a line and cut it into 1 long, skinny rectangle. Fold the paper in half & crease the edges. Then folded in half again with a fold parallel to the first fold. Take the top layer of paper flip the edge back to meet the fold & crease. Turn the paper over, again flip the edge back to meet the fold & crease. Open the paper and continue folding each as mountain fold(fold in zig zag way). You will now have an 8 page accordion fold. Now its time to decorate accordion fold and turn into thank you card. Take a quilling strips of any colour apply some glue and paste quiling strips on 1 side of accordion fold this will be outer part of card. Now other side of accordion fold you can write ‘Thank You’ with the help of small pieces of quilling strips and glue.this will be inner part of your card. Now arrange the accordion fold systematically that the outer part will be seen and inner part will be hidden. Take a thread and tie the accordion fold Thank You Card to give attractive look.you can use some stars , emoji stickers for decoration purpose. Hand made things are always special to everyone. Specially if it is for mother. When you made something or greeting card for mother that is a very unique and previous gift for her. 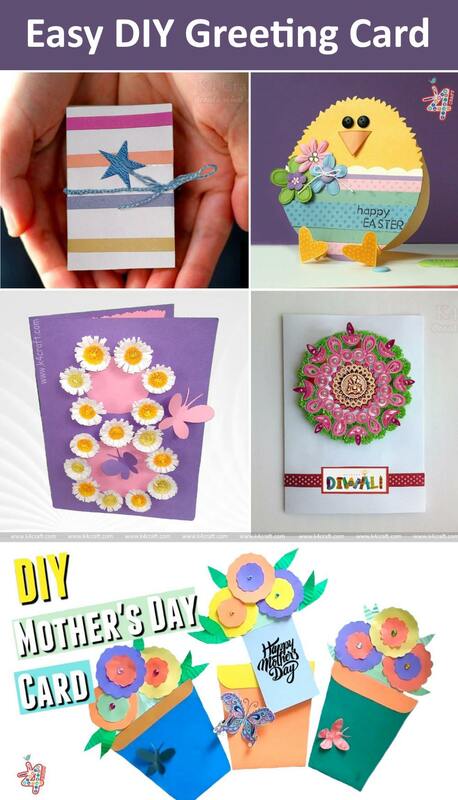 So here is the tutorial of ‘Easy Mother’s Day Card’ for kids .Give the best gift to your mother. Take a papersheet of any colour and fold it into equal parts. Measure 11CM×11 CM down the fold and cut it for making a pot base. Measure 1.5CM down the fold from both the sides & cut both layers to the unfolded opposite corners. Cut a piece of paper, measuring (1/4th top of the pot)and cut along one of the long edge. Apply a glue both the sides of paper(pot sides) and have the center open like a pocket. now that long edge fix to the top of the flower pot and trim the excess off. For flower making – cut 2 different size of circles and trim it in the shape of flower. Stick the smaller circle flower into the bigger circle flower. Make it as much you needed. Also make some green paper leaves. For the top of flower pot cut a paper into semicircle flower shaped. Cut a piece of coloured papersheet, measuring 10 CM×6CM. This will be the slider which will be fit into the flower pot and will also hold hidden message. Stick that semicircle flower shaped paper to this slider. Put this inside to the flower pot. Now it’s time to arrange flowers and leaves on the top of the slider. Between the flowers you can put stones for decoration. Art and craft is a part of creativity. Kids are loved to do easy paper craft . 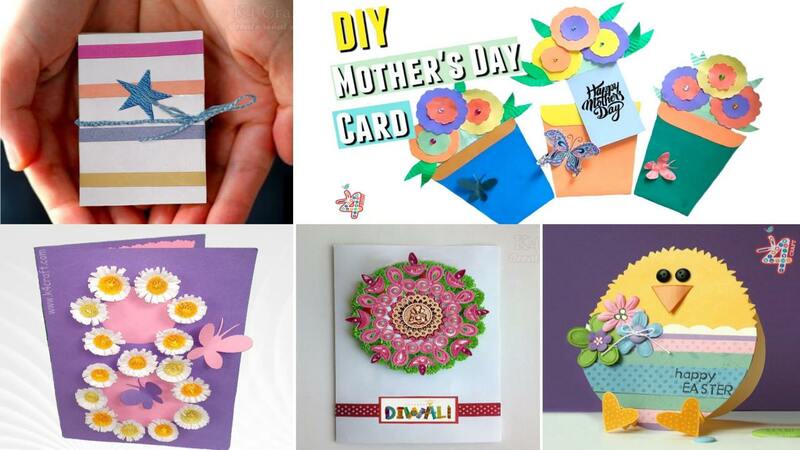 This summer learn a very simple and creative card making . Here is an easy tutorial of ” Easter Chick Card”.making for kids. Take a colourful papersheet and fold it to divide in two equal parts to create card base. Draw an egg shape on it with card folded, cut egg shape. Looking closely by the side of the cut egg, you will see the fold. Cut another coloured paper , measuring from center to bottom of the egg shaped card. Apply glue and stick the half egg shaped paper on the bottom of the card base. Take some different colours of strips and stick to the bottom of the card, trim the excess off. For the top of the card, take a papersheet and draw the upper part of the egg make some feather shaped outline. Cut it carefully. Place this paper on the upper part of the cardbase and stick it . Make chick face with 2 black eyes and 1 orange nose on the upper part of the card. For decoration – you can make some paper flowers and you can paste it on card. Paper art and craft is the best way to express our feelings. Everyone love to do paper craft. For every occasion/purpose you can create greeting cards. Here also a tutorial to make an easy and quick greeting card on the occasion of women’s Day Special Card. You can give this cards to your mother, sister, friends, colleagues. Take one coloured sheet and fold it into half for making greeting card. Now the upper side of the card make a big circle down side and above it make a small circle. Take other papersheet and measuring 1.5CM and cut it into a long strip. Again take a different coloured paper and measuring 1CM and cut it into a strip. Fold all the strips into half and then folded in half again. With the help of scissors cut fringes on the strips, leaving an edge with a width of about a centimetres. For making 1 flower you will need 1 strips of 1.5CM and 2 strips of 1 CM. Join all the strips together with the help of glue. With the help of slotted tool/ tooth pick, start rolling from smaller part and moved to bigger part of the strips. At the end of strip put some glue and stick it. Arrange and pull out the fringes to make the flower look blooming. Make flowers as per your requirement. Take colourful papersheet fold it into half and trim it down little, so that it’s a bit smaller than the greeting card. Apply glue and place this paper inside the greeting card. Now arrange this flowers on the border of circles which is on your greeting card. You can decorate greeting card with beautiful butterflies or glitters. Quiling is an art which is very much in trends now adays. Quiling is used to making beautiful flowers, leaves, patterns. It’s look like a difficult but here, with this tutorial you come to know how easy quilling is and you can make a beautiful design from it. Take two quilling strips and join together. Roll it tightly around the diya and stick the end of strip. Remove the diya and will get a circle. Take 1 strip and roll it ightly with the help of slotted tool, glue it at the end of the strip. Make this tight roll as per your requirement. Take different colour of quilling strip, roll it with slotted tool and put it into the qulling board to make a loose closed roll.make this rolls as per your requirement. Take 2 quilling strips join together and roll it . After completion of roll put in the quilling board to make a loose closed roll. Glue it at the end of the strip. Fold this loose closed roll from the center and bring both the sides together and with the help of other strip wrap it around, make sure the two tips stay touching. I like wrapping the border around 2 times. Take 1 strip and add 1/4th part of other colour strip and with the help of slotted tool roll it. Make a loose closed roll fold it from the center. It’s look like diya shape. Take another 1 strip, roll it and make it little bit loose roll. Stick the end and pressed lightly from 1 side ( teardrop petal). Take papersheet/cardboard apply some glue on the circle(made in step 1) and stick it. Arrange the tight rolls(made in step 2) around the circle. After completion of tight roll circle ,Also arrange the loose closed rolls (made in step 3) . Now stick the pètals (made in step 4 and 5) after completing the circle of loose closed rolls . Put some gap between the petals. Now make a diya shape with the help of step 6 and step 7. Stick the teardrop petal on the top of loose closed roll. Glue it together. Now stick this diya’s between the petals on the papersheet. For decoration you can stick the curled strips at the side and the bottom of the card. Stick pearls in the 2nd row of loosed closed rolls. You can put any diya or ganpati piece to fill the center gap. Don’t forget to share our article with your friends and send them best wishes. 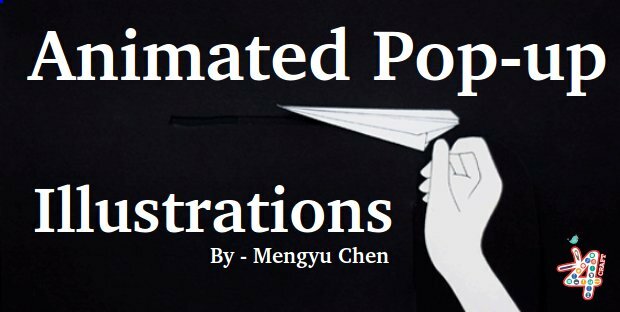 Animated Pop-Up Illustrations Book For Adults!